One of the special privileges we have here at Studio B Portraits is the opportunity to grow with our families as they add to their numbers. We have been photographing the lovely Salamanca family since Jennifer came in for maternity photos with her first baby. Fast-forward seven years, two more kiddos, and numerous Family Portrait Sessions to the present day! Our most recent project was the custom design Watch Me Grow wall in the Salamanca home, and we are in LOVE with the way it documents each stage in their family’s life. No. 1: Measure Your Wall. 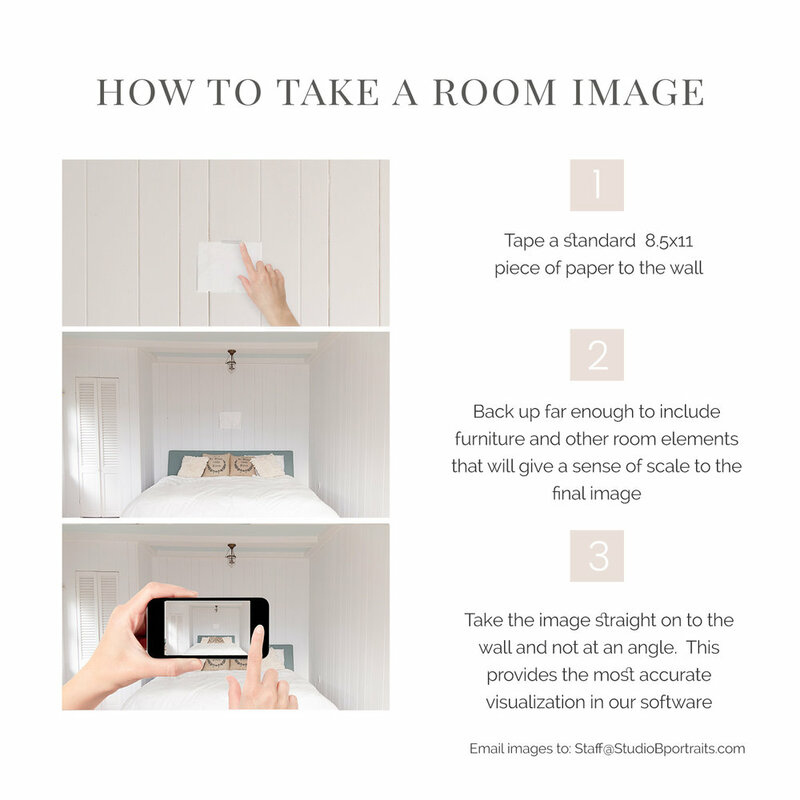 One unique aspect of the wall design process is that we use simple snapshots of your actual home to customize a design that is mocked up to scale with beautiful portraits from your session. That way you can view your design options in real time during your order appointment rather than relying on your imagination to visualize your space. Follow our step by step tutorial to take snapshots of your space without hassle! No. 2: Pick Your Prints. For those who have been collecting gift prints over the years of all your favorite moments, this is a beautiful way to display a timeline of your growth as a family. As you move through your home, you’ll literally be taking a walk down memory lane! No. 3: Trust the Experts. From selecting your frames to match the style of your decor to personal home installations, the Studio B Team is happy to help every step of the way! Ready to customize your wall space? Did you know that Studio B can help you design a Picture Perfect Portrait Wall? 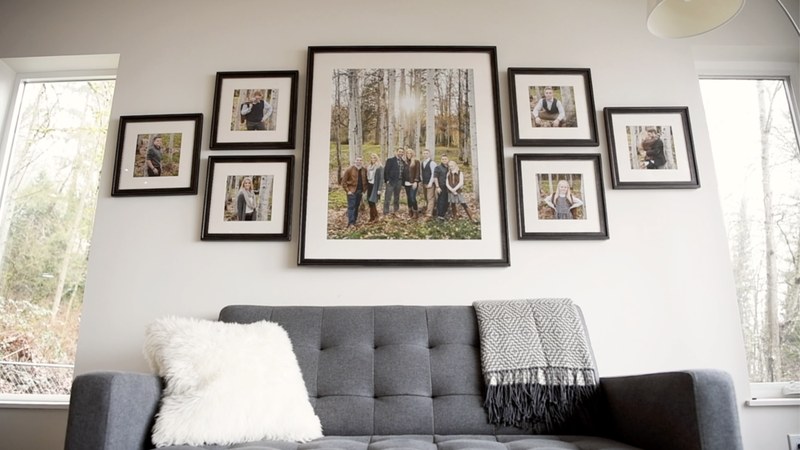 Did you know that Studio B can help you design a Picture Perfect Portrait Wall for your home? Yes, it's true - Studio B is a full service portrait studio and this complimentary assistance is included with every photography session. One unique feature in the customization process is that we use simple snapshots of your actual home to create your wall design. Not only does it allow us to consider the beautiful colors and spacing of the area in which you're hoping to display your images, but we use those images to mock up what your favorite portraits from your session will look like hanging on your walls. If you're highly visual (like us), this simplifies the process so you don't need to use your imagination to see what your images will look like; you can see it in real time during your order appointment! And the best part? It's super simple - just 3 easy steps. Studio B Portraits complimentary design service uses the power of virtual renderings to help you visualize your beautiful wall portraits in your home. Our Studio B team takes joy in custom designing wall-worthy portrait displays so that you can cherish your favorite memories for a lifetime. Not only will these portraits celebrate this current season of your lives, but they will also become heirlooms to treasure. Every time. Seriously, every time I get one of these messages from our clients it is like Christmas morning for me. (I'm actually smiling at the screen right now as I write this) I just want to say a big thank you to Mom Joyce for sharing this snapshot of the senior portraits that we created for their beautiful home. So excited to share this "Show Us Your Wall" snap from Mom Danelle featuring her gorgeous kiddos. We first photographed brother Jacob a couple years back and this year we were lucky enough to have Class of 2018 Senior Izzy in front of our lens. Each of these Giclee Canvas wraps are 24" and look so clean, contemporary and chic. I loved show and tell when I was a kid...and clearly not a whole lot has changed because I'm still doing it here! We just installed this 8 piece wall art display in the Maron's front living room and I just couldn't wait to share. This Signature Print series is both eclectic and cohesive featuring a combination of mat + frame, as well as straight fit "sister moldings -- (def: Sister molding are frames that are not identical but complimentary --they hang beautifully on a wall together) The largest of the pieces finishes at 24 inches long. So if any of you have caught my recent attempts at channeling my inner Martha Stewart #CookieFail then you will understand why I am completely green with envy every time I do a photo shoot with Monica Hart for 425 Magazine. The true disconnect of course is that she makes it look so easy! (Probably on par with watching a professional ballerina from the comfort of your audience seat and secretly thinking... "ya know... I think I could totally do that!" :-P For this shoot we were on location at the beautiful Woodinville Lavendar Farm on a perfect Seattle morning and for all of us that love brunch... it just does not get any better that this. If you like this type of article, here's a quick link to some of our favorite "Show Us Your Wall" shares and recent client installations.